General Motors delivered a total of 195,909 vehicles in January, a 3.8% decrease from sales in the first month of 2016. Retail sales were also down, falling 4.9% at 155,010 units. Though sales were down, the automaker saw greater profits from its vehicles with an average retail transaction price of $34,500, up $1,200 from 2016 and goof for a new January record. “In early January, we focused on profitability while key competitors sold down their large stocks of deeply discounted, old-model-year pickups,” said Kurt McNeil, US vice president of Sales Operations. 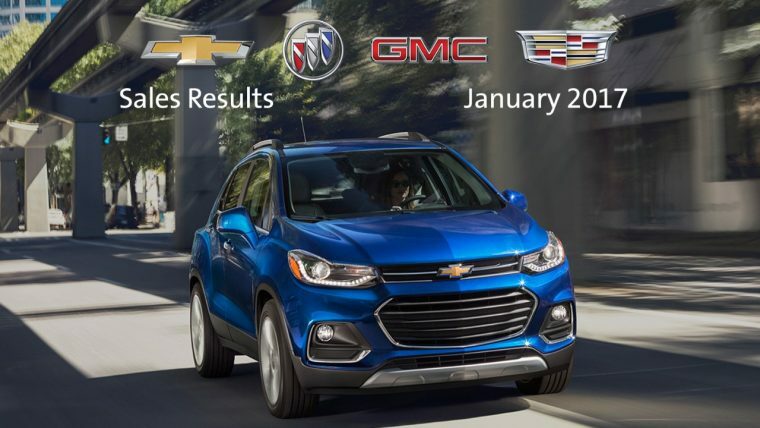 “We gained considerable sales momentum as we rebuilt our mid-size pickup, SUV, and compact crossover inventories from very low levels following record-setting December sales. Chevrolet sales were down 1.9% overall at 135,170 units, and retail sales fell 4.6% at 103,808 units. The brand was led in terms of volume by the Silverado at 35,553 units delivered, and in terms of growth by the Cruze, which saw sales increase by more than 4,400 units year-over-year. Buick saw strong sales from the Encore and Envision at 5,258 units and 2,187 units, respectively, but its overall sales were down 28.2% at 13,117 units. Retail sales totaled 12,597 units, down 18.5%. GMC’s overall sales grew 1.1% at 37,324 units, led by a 65.3% sales increase from the new Acadia. Retail sales were down 0.8% at 30,528 units. Cadillac saw a 1.2% retail increase at 8,077 units, driven by the continued success of the new XT5 crossover. Overall sales were down 4.1% at 10,298 units.